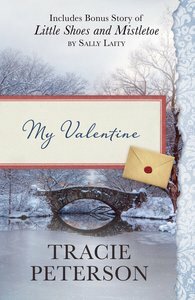 Readers will enjoy a poignant historical romance set in 1835 New York City from bestselling author Tracie Peterson. A prominent son and heir meets a Jewish shop girl, igniting forbidden love. Can social, cultural, and religious barriers be torn down? Also includes the bonus story, Little Shoes and Mistletoe by Sally Laity. Tracie Peterson is a full-time author who has written or co-written over 60 novels in both historical and contemporary genres which regularly appear on the bestseller lists, including the WESTWARD CHRONICLES, the YUKON QUEST and the SHANNON SAGA series. Tracie also teaches writing workshops at a variety of conferences on subjects including inspirational romance and historical research. Tracie and her family live in Montana. - Publisher. Sally Laity makes her home in Bakersfield, California, with her husband and enjoys being a grandma.